First Impression: The Biggest Loser Trainers are bathed in the Green Light of Fitness. Second Impression: Go to the light! This was one of the DVDs I got on trip to Salem as I was traveling for work. Earlier that same day, I had spoken to the proprietress of Hex Old World Witchery, who informed me that I am a vampire. If you’d like to hear the whole story, I tell it in “S1E6 Dress For The Verdict You Want” of the podcast I co-host, “THE GROWNUPS ARE TALKING with Robyn and Carla.” It’s available on iTunes, Google Play Music, and iHeartRadio! 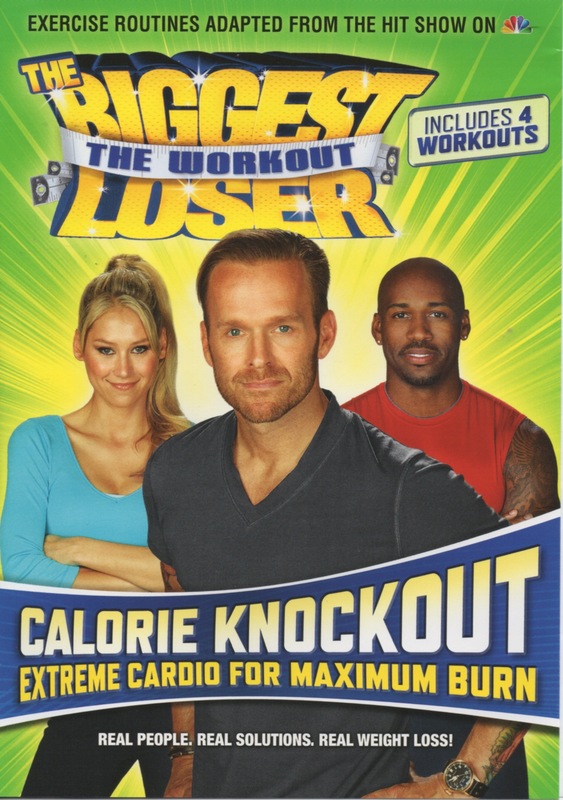 The DVD case of TBL: Calorie Knockout claims to “include 4 workouts” but there are only three. I did them all in a row, so I’m fairly certain! I just don’t know who to trust anymore. Neither does Bob. Look at his expression! He has no idea how he got caught up in this whole predicament. In the first segment, in which we are encouraged to kick and punch, I am struck by how much Anna Kournikova looks like Jennifer Lawrence. I am surprised that they have not been cast as twins with hilariously unequal tennis-playing abilities in one of those movies you watch on the plane, then immediately forget all about. Maybe their schedules don’t line up. David O. Russell, I know how much you like working with Jennifer, so feel free to use my idea if you want. I’ve got lots of ‘em! In Bob’s segment, there’s a lot of squatting and reaching with weights, and then some yoga moves to mix it up. When it’s time for Dolvett’s segment he’s all, “I can handle all the yelling, thanks. Plenty of yelling for everyone!” I think yelling is the worst way to motivate someone, because when you start yelling, no one is listening. But I must say, Dolvett provides plenty of motivation in the form of his 12-pack abs that are threatening to burst through his wonderfully tight t-shirt.